For Diddy Kong's special move, see Banana Peel (move). Official artwork of a Banana Peel from Mario Kart 8 and Mario Kart 8 Deluxe. The Banana Peel (バナナのかわ, Banana Peel) is an item in Super Smash Bros. Brawl, Super Smash Bros. 4, and Super Smash Bros. Ultimate. In Ultimate, in addition to Banana Peels appearing on their own, users will be left holding one after firing a Banana Gun. Slipping on banana peels is a classic slapstick gag. Among Smash-related games, the Banana Peel appears as an item in the Mario Kart series starting with the original Super Mario Kart: it can be placed on the course as hazards, and if a kart touches one it slips and spins around for a short time. However, unlike the banana peels in Smash, the ones in Mario Kart have faces and can affect their user and in addition, the item serves as the logo of the Banana Cup since Mario Kart DS. The Banana Peel can be thrown like any other regular item, and when a character other than its thrower steps on it they slip and are temporarily stunned. The banana itself flies a short distance sideways, just far enough that if the slipper rolls the wrong way, they will slip again. Diddy Kong's down special move generates Banana Peels even with items turned off, which is an important strategy in tournaments because it often disrupts an opponent's ground game, forcing them into the air. 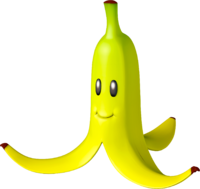 Banana Peels can also make opponents trip if their feet or shins touch a stationary banana during an attack on a platform above them. Bananas retain the same functionality in Smash 4, with one critical difference - as soon as any character slips on them, they disappear, so they cannot be used more than once. This change did not exist in early versions of Smash 4. The Banana Peel trophy from Brawl. The peel from a Japanese fiber banana of the Musaceae plant family. It contains a high volume of vegetable oil, which oozes out when the peel is stepped on, making things slippery. In Smash Bros., the peel fulfils its destiny as a comedic prop by making passersby slip. Characters who land on their backsides will be defenseless until they recover their footing. The Banana Peel trophy appears in both versions. In Super Smash Bros. for Wii U it is part of the Brawler Trophy Box. Looks like someone had a nice snack and didn't bother to clean up afterward... As you may suspect, stepping on a banana peel sends you falling to the ground and exposes you to attacks. You can throw these at your opponents too, but please clean up when you're done, all right? HEY! Put that banana peel in the bin! ...Oh, you're going to trip up your opponent with it? Carry on, then. Of course, picking up and throwing banana peels at people is disgusting, but they'll have a hard time keeping their defences up if they're putting on a one-man slapstick act, so...go ahead. Official artwork of the Banana Peel in Brawl. fficial artwork of the Banana Peel in Super Smash Bros. for Wii U. This page was last edited on April 19, 2019, at 22:03.